1. Reese's Peanut Butter Cups. You can't go wrong with a classic, especially when there's peanut butter involved! 2. Popcorn Balls. 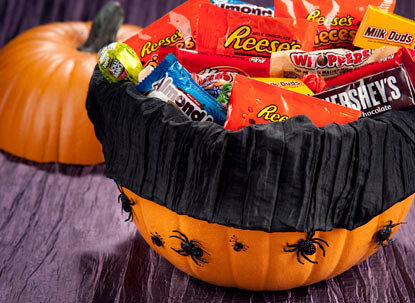 Not really a "candy," but they just seem to go hand-in-hand with trick or treating. 3. Swedish Fish. One of my most favorite candies! 4. Lindt Lindor Truffles. I never got these in my Trick or Treat bag, but I did just receive two cute little bags (along with Swedish Fish!) 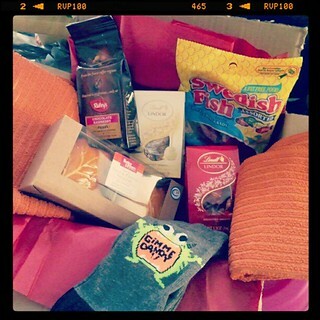 in a birthday goody box. 5. Chocolate Minis. Those little snack size Butterfingers, Almond Joys, Hershey Bars, Kit Kats, M&Ms, etc. Of course, "snack size" sure has shrunk over the years. 6. Hershey Kisses. 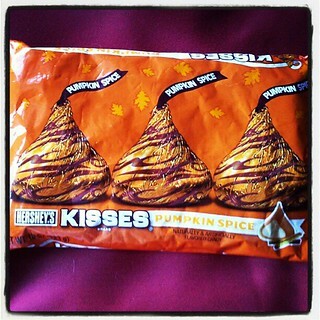 I'm partial to the pumpkin spice ones this time of year! 8. Dum Dum Pops. Because, seriously, when else do you get these? Well, other than TNT autograph nights at racing when everyone puts out candy. I discovered some really amazing new flavors of dum dums this summer! 9. Ring Pops. Another fun one! 10. 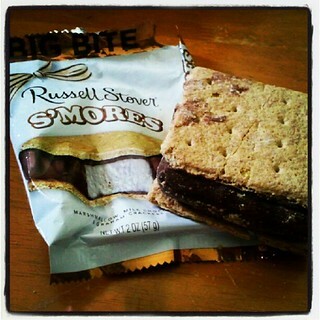 Russell Stover S'mores. OK, so I'm guessing no one has ever found one of these in their Trick or Treat Bag, but I would sure love to! Yummy. Have a terrific Tuesday. We never get any trick or treaters, but we still buy candy so we can eat it ourselves. Never grow up! Dum Dums... they give 'em out at the bank! A modern-day treat, though probably not given out due to cost, is dark-chocolate covered Peeps. Love those! Aw, crap, you're ruining my diet just thinking about this topic! OMG - popcorn balls! Do people even put those in trick or treat bags anymore? Those are the BEST!! !